If you are a roofer, then you already know that your job consists of working in the hot and cold temperatures. From the top of the roof, the heat fries your skin and the cold chills your cheeks a lot more drastic than if you were on the ground. 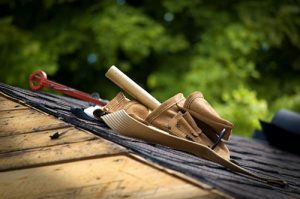 You also must deal with the stress of getting those shingles straight, while concentrating on keeping yourself firmly attached to the roof without the worry of falling to the ground. For the sake of security, you will want to wear a pair of durable boots that will grip the roof without worry. Of course, a boot that offers the perfect fit, comfort, and style is equally as important to the stability. Thorogood has a reputation for making their boots in America, and this pair of boots is no exception. The leather boots are built with reinforced seam rivets to avoid damage, and the rugged oil, tan leather uppers make these boots stylish. The Goodyear storm welt construction can be re-soled when the time becomes necessary, and they offer a supportive, lightweight fiberglass shank for added arch support. 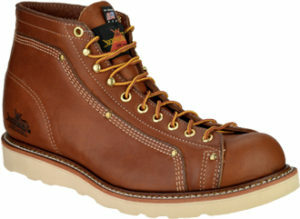 With the hard-grabbing Vibram Christy blown rubber wedge outsoles, the boots will keep you securely on top of the roof. A removable Ultimate Shock Absorption foot bed was thoughtfully built into this boot, and the Peron 4000 comfort cushion will make your feet feel like they are wrapped in sneakers. The boots are easy to lace with the 6-inch lace-to-toe strings, and there are a numerous number of eyes for speeding up the process. Although these boots are offered in sizes 5.5 to 14, the reviews state that they come large in length with a narrow width. It is highly recommended that you choose a size smaller than usual to fit properly, keeping in mind the narrow width of course. Some consumers have complained of the boot neck rubbing against the ankles, but that should be an easy remedy with the proper socks. Overall, these boots have a great rating with very few negative reviews. The price is right, the comfort is excellent, and the style is great! Just like the others, these boots are also made in America, and they are made with high quality, oil-tanned brown leather uppers. 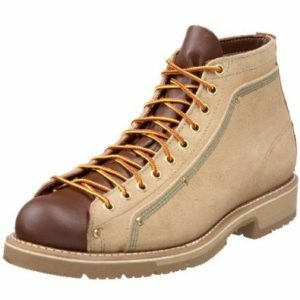 Thorogood is known for building their boots with Goodyear storm welt construction, and seam reinforcement rivets are common for many years of durable assurance. Consumers consider this boot to be comfortable enough to wear all day. 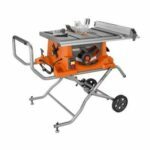 Maybe that is because it is made with a Poron 4000 cushion design that is made for long-lasting comfort. A cotton drill vamp lining was carefully put into this boot, along with the synthetic sole. The removable dual-density foot bed is designed with shock-absorbing material. The shaft measures at approximately 5.5-inches from the arch, and the laces are approximately 67-inches long when laced. These boots are so stylish and comfortable that some people wear them as everyday shoes, and since they have been known to keep a solid grip on a wet roof, there is a good chance these would be a great choice for standing solid on a wet ground. These boots are available from sizes 6-13, with wide width options, but just like the others, the biggest complaint is that they are sized bigger than normal sizes. Some people have even complained that these boots are about a pound or so heavier than other boots of comparable quality. The good outweighs the bad in these roofer work boots with a 4.1 out of 5-star rating, and the price is affordable compared to others. With all that is considered when choosing a great pair of roofing shoes, these would be a great choice! 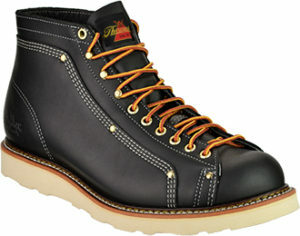 Another great boot from Thorogood is this two-tone American Heritage. These great boots are made of leather and offer the ever-popular lace-to-toe design that will fit perfectly on stubborn and awkward feet. The slip resistant leather sole can be replaced when it wears down, and it is designed to grip a roof, keeping you securely in place. The comfort weave lining and fiberglass shank are compatible with the extra thick insoles, making for the perfect, all day fit. Like the others, these boots also size larger than normal, so it is recommended that you purchase at least a half size smaller for a better fit. Many people have stated that these boots will need some time to break in, thus some have been known to wear them on short walks before wearing them for work. A few people complain that they are bulky and a little heavy compared to some of the other boots of this caliber. The price seems to satisfy the average consumer, and although these boots have a lower rating than the others we have listed, they are still very popular, and most people have said they would buy them again. With all these choices and facts in mind, you should have no problem when choosing the best roofing shoes to fit your needs!